There is an app now which can download Gapps automatically on your phone. 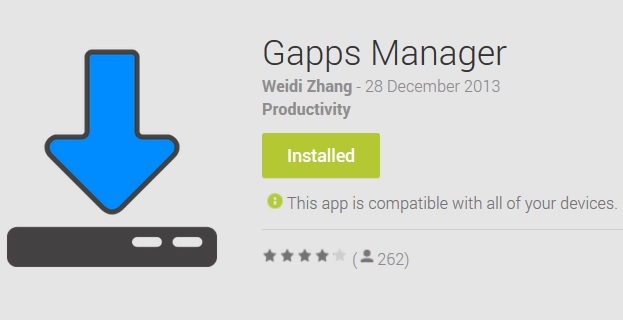 The app “Gapps Manager” is written by XDA member Weidi Zhang aka ebildude123 and uploaded a copy in the Play store. After you install the app, open it and click on your Android version to download Gapps easily. If you don’t know which Android version you have, just press the option and select “Android Version“. You will be given a message “You are running Android x.x.x“. I’ve written a post on How to Know Which Android Version You Have, you can check this as well to know your Android version. After you get the version number, if you are running Android 4.4.2 press the first option to start downloading your Gapps in a .zip file. You can find the file in your Download folder in your selected storage after download complete. Now, you can flash the file using custom recovery or your chosen way. This is the easiest way to download Gapps in your Android phone. This could more useful if the custom ROM developers put the Gapps Manager app in their future ROMs. Users don’t need to look for the app to download Gapps in their device. If it comes pre-installed, end users just need to use the app to download the Gapps zip package and use it. If you are looking download the app now, head over to XDA forum and the alternative Google Play link is here.